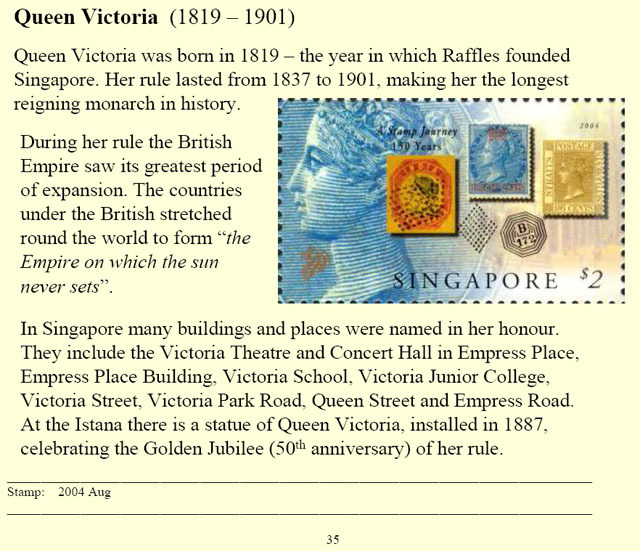 Queen Victoria was born in 1819 – the year in which Raffles founded Singapore. Her rule lasted from 1837 to 1901, making her the longest reigning monarch in history. During her rule the British Empire saw its greatest period of expansion. The countries under the British stretched round the world to form “the Empire on which the sun never sets“. In Singapore many buildings and places were named in her honour. They include the Victoria Theatre and Concert Hall in Empress Place, Empress Place Building, Victoria School, Victoria Junior College, Victoria Street, Victoria Park Road, Queen Street and Empress Road. At the Istana there is a statue of Queen Victoria, installed in 1887, celebrating the Golden Jubilee (50th anniversary) of her rule. Can you remember a time when Singapore was ruled by a King? Many people can’t! However, our grandparents may recall a time when people in Singapore saluted the British flag (the Union Jack) and sang the British national anthem (God Save the King). 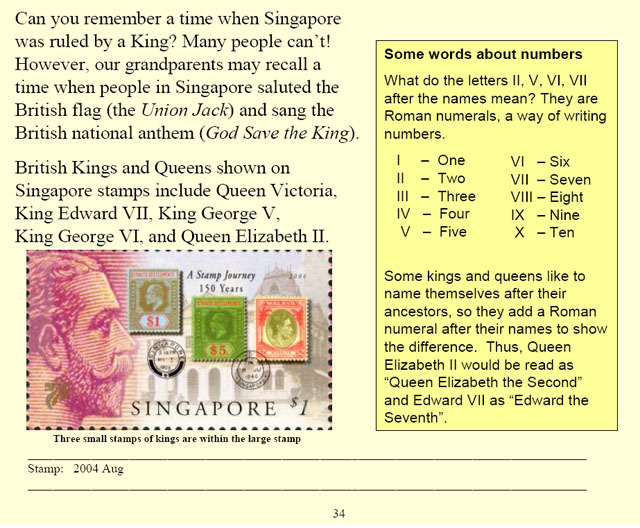 British Kings and Queens shown on Singapore stamps include Queen Victoria, King Edward VII, King George V, King George VI, and Queen Elizabeth II. What do the letters II, V, VI, VII after the names mean? They are Roman numerals, a way of writing numbers. Some kings and queens like to name themselves after their ancestors, so they add a Roman numeral after their names to show the difference. Thus, Queen Elizabeth II would be read as “Queen Elizabeth the Second” and Edward VII as “Edward the Seventh”. In the 19th century the British Empire stretched around the world and was known as “the Empire on which the sun never sets”. 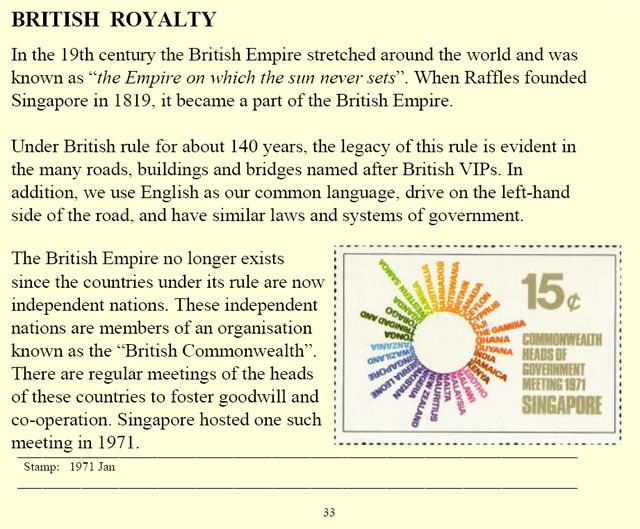 When Raffles founded Singapore in 1819, it became a part of the British Empire. Under British rule for about 140 years, the legacy of this rule is evident in the many roads, buildings and bridges named after British VIPs. In addition, we use English as our common language, drive on the left-hand side of the road, and have similar laws and systems of government. The British Empire no longer exists since the countries under its rule are now independent nations. These independent nations are members of an organisation known as the “British Commonwealth”. There are regular meetings of the heads of these countries to foster goodwill and co-operation. Singapore hosted one such meeting in 1971. Dr Sun was born in China in 1866 but had his school education in Hawaii. In 1892 he graduated as a doctor from the University of Hong Kong. He was active in revolutionary efforts to end Qing Dynasty rule. Between 1900 and 1911, he visited Singapore on eight occasions to raise support for the revolution. In 1911 the Qing Dynasty collapsed. The Republic of China was formed in 1912 and Sun Yat Sen became its president. 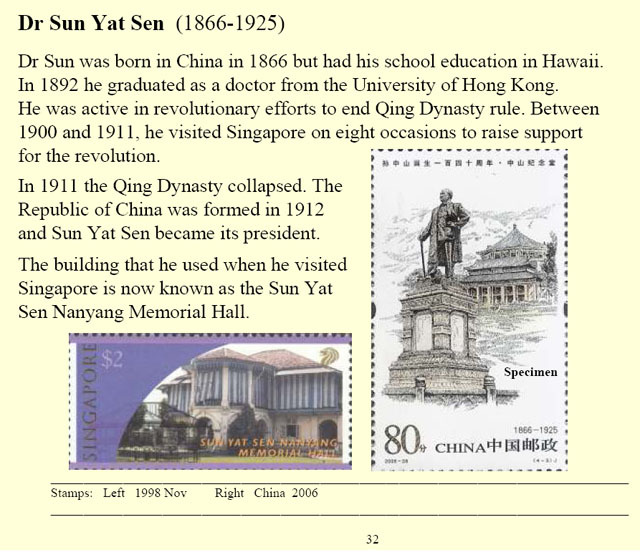 The building that he used when he visited Singapore is now known as the Sun Yat Sen Nanyang Memorial Hall. 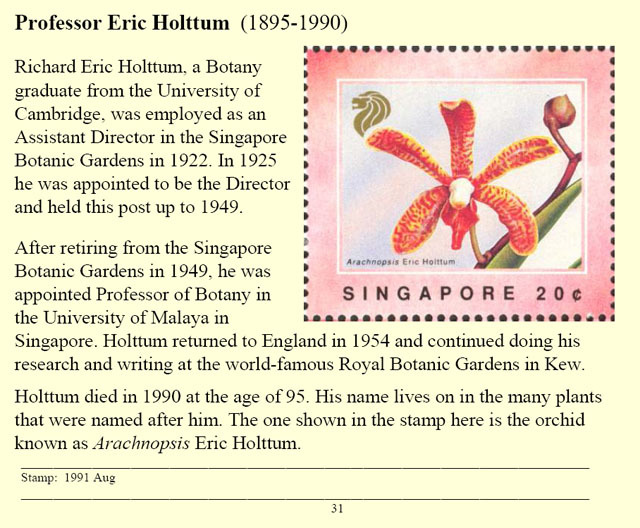 Richard Eric Holttum, a Botany graduate from the University of Cambridge, was employed as an Assistant Director in the Singapore Botanic Gardens in 1922. In 1925 he was appointed to be the Director and held this post up to 1949. After retiring from the Singapore Botanic Gardens in 1949, he was appointed Professor of Botany in the University of Malaya in Singapore. Holttum returned to England in 1954 and continued doing his research and writing at the world-famous Royal Botanic Gardens in Kew. Holttum died in 1990 at the age of 95. His name lives on in the many plants that were named after him. The one shown in the stamp here is the orchid known as Arachnopsis Eric Holttum. 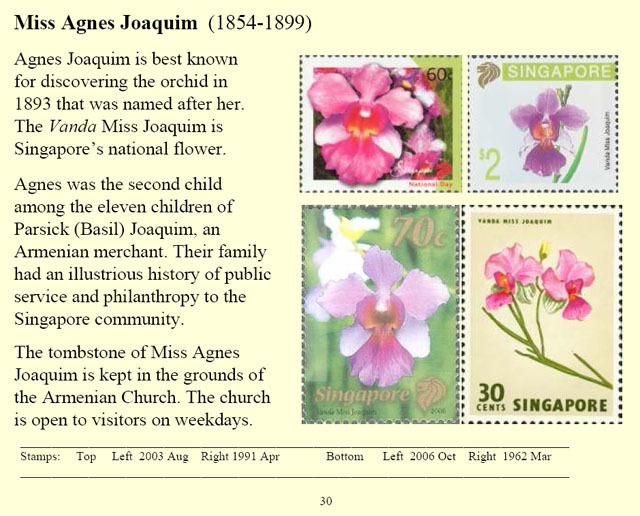 Agnes Joaquim is best known for discovering the orchid in 1893 that was named after her. The Vanda Miss Joaquim is Singapore’s national flower. Agnes was the second child among the eleven children of Parsick (Basil) Joaquim, an Armenian merchant. Their family had an illustrious history of public service and philanthropy to the Singapore community. The tombstone of Miss Agnes Joaquim is kept in the grounds of the Armenian Church. The church is open to visitors on weekdays. Abdul Gaffoor was a well-educated Indian Muslim and worked as the chief clerk in the law firm of Khory and Bridges. 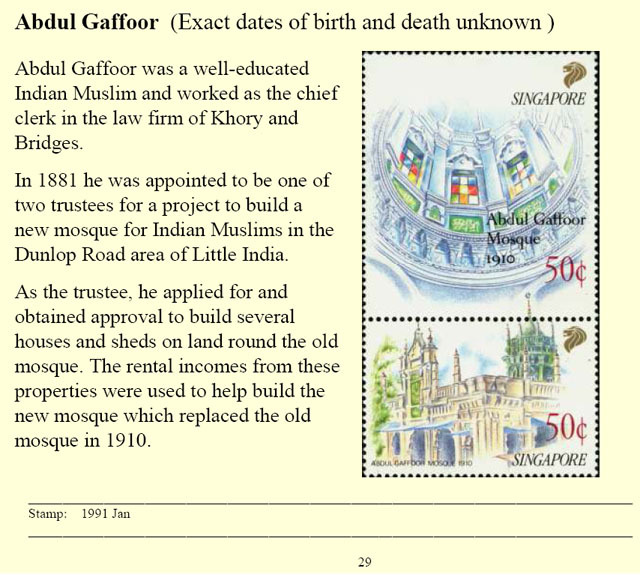 In 1881 he was appointed to be one of two trustees for a project to build a new mosque for Indian Muslims in the Dunlop Road area of Little India. As the trustee, he applied for and obtained approval to build several houses and sheds on land round the old mosque. The rental incomes from these properties were used to help build the new mosque which replaced the old mosque in 1910.